You did what to a quilt? 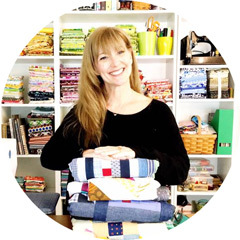 Sometime before Market there always seems to be a collective burst of creative energy from the entire quilt world! You can see all the building excitement on Facebook, Twitter and especially Instagram! It strikes just about everyone. About a week before the event I had an idea. It was one I had played around with previously but for some reason never fully embraced. This time, I decided it was a must have! 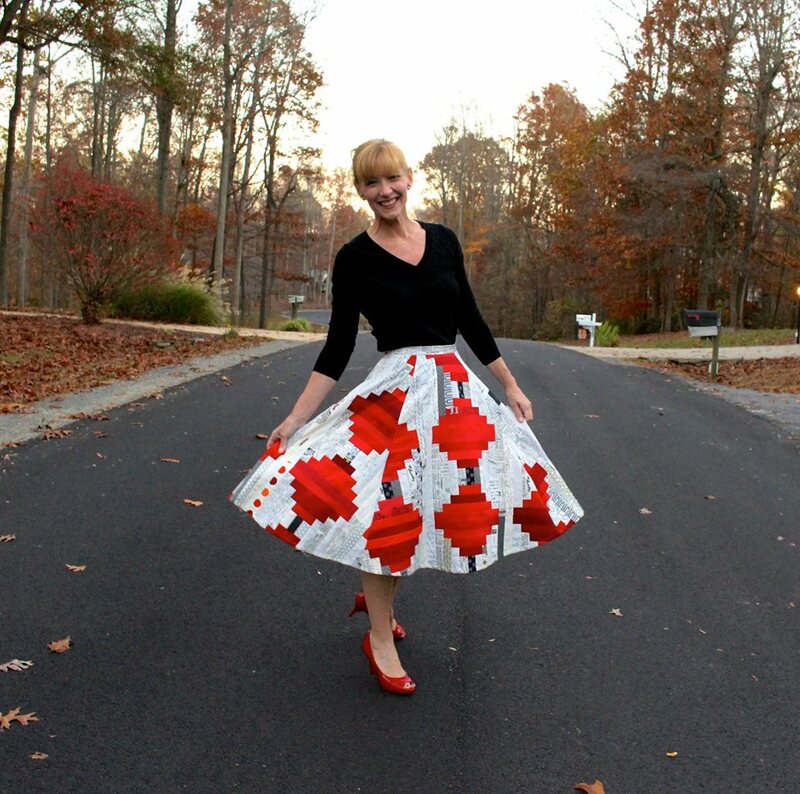 A quilt skirt! I knew it had to be red and I wanted something fun to make the background dance! I chose a jelly roll of Zen Chic for Moda Fabrics and various reds from my stash to create the log cabins. I pieced with Aurifil 50wt and constructed the skirt with 40wt. I used a circle skirt pattern from Butterick B5882 which is a lovely dress but I only needed the skirt and did not want to do the math! It took only two days to make the completed quilt top! The log cabins are 12in finished blocks and were super easy to whip together. I made the center 2.5 x 1.5in and all the rounds are 1.5in strips Easy peasy! I pressed as I went to keep everything flat. I did not line the skirt ( no time) and wish that it had pockets ( next time). The in-house engineer and the teenaged girl, who typically have NO opinion whatsoever about my quilts both questioned my decision to make this into a skirt. They would deliberately stroll through the sewing room and throw a " Are you sure?" in my direction. The doubt was certainly growing. The quilt is stunning! Katy and I played with the placement for a few hours then went to bed. The following day, I wanted to make the skirt to have it ready to wear for the Market floor! I went straight to work! I cut out the front of the skirt and realized that I had gut it in the WRONG direction! OMG! I thought I was going to throw up! I may have had more than a slight panic attack! My original idea was to have the the direction of the dots horizontal and the links connecting! This was not cool! I cut the rest of the pieces out, knowing that there was no way I would have the time to make an entirely new quilt and decided that the Japanese lanterns looked pretty amazing too! Honestly, nothing else was done in the house while all of this was happening! The people of the house had to scavenge for food and this was my real sewing space. This is what we all do for our passion! I love this skirt! There are now more ideas for creative uses with quilt making techniques in garment sewing for upcoming events! I love this idea. Not sure if I'd want to make a quilt top just for a skirt, but I'm seeing potential for those tops that wind up languishing in UFO land waiting to be finished. I think it's stunning on you! It looks amazing, and you wear it so well. I'm impressed with how quickly it came together. Beautiful skirt! What a clever idea, I love the design you chose. You look so beautiful and the skirt is amazing! Totally brilliant and lovely on you! It is amazing! One of my favorite things from market!!! I caught sight of you at Market. You looked great in this awesome wearable art. I love this but I must confess I already saw a picture of you wearing it at Market somewhere online, can't remember where. This was a fun read to hear the backstory on your unique creation! You look sensational! Here's what I am wondering though, and it's what I always wonder when I see skirts/ dresses made out of quilt tops.... Did you back it? Or interface it? I would be worried about it coming apart. This is amazing, a real show stopper! I bet it was a showstopper! WOWSERS!!! totally rockin' the quilt world w/this amazing skirt. I wish I lived closer as I could ask you a few questions. I'm SO impressed!! !